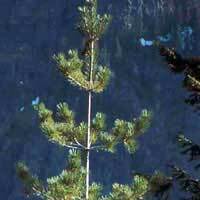 Like all five needle pines, the thin needled folliage is fine and feathery looking at a distance with a light blue green appearance. This tall tree is spectacular in the landscape but needs lots of space. Symetrical in appearance, it does not prune as well as other pines. It will grow in both dry and moist conditions but can suffer from white pine blister which can kill a tree quickly.